There are certain things I am good at and then there are those other things that I never learned or tried. You know, stuff like cooking, sewing, juggling, snapping, watching romantic dramas, shoe shopping, and getting a tan. But in a recent blog post, I indicated my want to start eating healthier, and with that comes the idea that I need to make my own meals and know what is in the food I eat. In the past four years, I have become a pro at memorizing nutrition guides for many ‘fast’ food restaurants and sandwich joints in the city and suburbs. As much as I kick and scream at the thought of growing up (hence my love of coloring books and toys), it’s time to grow up and get some big girl skills. So today, I hit the blogs and thanks to a good friend, Stina (her blog is here: ), I was able to browse a few blogs that post great recipes. I highly recommend Stina’s blog since she has been a large source of information for me since a lot of her goals are aligned with mine (some of which, she is way ahead of me in achieving). We ended up on the topic of food after we were discussing a dessert to make for my boyfriend’s birthday–which is going to remain a secret for now. I chose to make the Spinach-Feta-Turkey-Burger. So I hiked all the way to Orland and hit up Trader Joe’s with about five recipes in my purse. After spending about $60 and renewing my love of shopping at Trader Joe’s (PLEASE OPEN A STORE CLOSE TO ME! ), I headed home with tons of positivity and a sinking feeling that I forgot something. After putting away groceries in my kitchen, it dawned on me. Hamburger Buns. Yeah, I had regular bread, but who would make amazing Turkey Burgers and put it on regular sandwich bread. How do I always manage to do this to myself? Happily, I had bought ingredients for two other recipes. 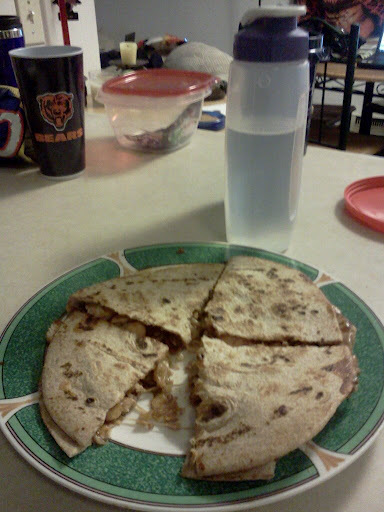 I ended up making the BBQ Chicken Quesadillas. Now, I didn’t really follow the recipe. I bought wheat tortillas, chicken, low fat mozzarella cheese, and BBQ sauce. I always cheat and take out the onions and bs my way through it. But it turned out pretty good even though it kind of fell apart. Later, I will be making homemade granola bars. I may opt to go for a run and make the granola bars tomorrow but they will be made. In the past, I have made the mistake of buying ingredients to make a particular dish or try a new recipe but end up being too busy to make it, and the ingredients spoil and get thrown away. Anyways, I am taking a step in the right direction! Horray for positive changes!